From a Concert at Cosmopolite in Oslo November 25 , 2012. Tommy Smith Saxophone, Paolo Vinaccia drums. «Science» Filmed at Victoria Jazzscene,Oslo Feb.2012 . 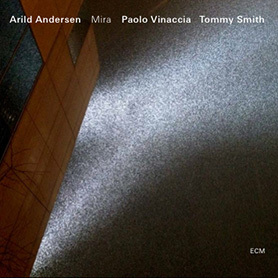 Tommy Smith sax, Paolo Vinaccia drums,Arild Andersen bass. Marcin Wasilewski piano , Arild Andersen bass ,Patrice Heral dr.
Stan Getz with Arild Andersen . Peter Madsen on piano, Ben Riley on drums. This is a concert from Paris 1972 or 73 . The short photo of a man just before we start playing is Andre Francis. He is a legend of his own in France and the voice on most live recording from the Juan les Pins Festival. He gave me the prize » European Jazz musician 2008 » and I was so honoured by meeting him that I almost forgot to say thank you.